Liza O'Connor - Author: Liza causes Devika to stray off course...several times. Liza causes Devika to stray off course...several times. 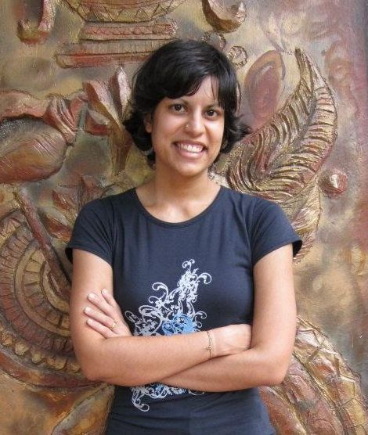 Today, I have Devika Fernando on my blog for an interview. Liza: Normally, when I interview an author, they are so busy, that they’ll say the funniest things without realizing it. Then I can, with great love, tease them. But I fear that’s not happening today. Devika is a very precise writer. She doesn't play fast and loose with the language. Every word she writes is with consideration. So I’ve no idea how this interview is going to go. Devika: Such high praise, thank you. I guess I take special care with what and how I write because English isn’t my first language. And hey, knowing (more or less) 8 languages sort of makes you careful not to make a fool of yourself. Liza: I’m pretty sure I’d just be silly in 8 languages. Now to the interview: Is there anything you don’t like about being a writer? Devika: Not really. Writing is the most fun part of it, but even editing is something I like, because although it’s a difficult and dreary task, you learn something about your own writing and you get a chance to make the book better. Promoting takes a lot of time, but it can also be interesting, and I love connecting with fellow authors and readers. Liza: This is what I mean. Your answer remains on point with no ambiguous statements I can purposely misinterpret. Also I completely agree with you, so I can’t even argue against your perception. What part of your book was the hardest to write? Devika: With “Playing with Fire”, it was everything that involves the police / the legal side of it. Although I read crime novels, I initially had no idea how the crime of arson is handled and how they might try to catch Felicia, the heroine who possesses fire magic. Liza: Again, total agreement. Anything associated with the law or crimes is very difficult to get right. Has a secondary character ever threatened to take over your book? Devika: Luckily not. I make sure this won’t happen by either writing an antagonistic secondary character or by keeping their profile low. Liza: Here we diverge. Devika remains in control of her characters, whereas I let mine run loose like wild cheetahs. But still I cannot tease her approach. It sounds very sensible. Seriously, have you ever tried to rein in wild cheetahs? I think not. So how'd you come up with this story? Devika: “Playing with Fire” was inspired by fantastic artwork I saw on deviantart.com, and it just wrote itself in my head. From that grew the idea of the “4 Elements of Love Series”. The Water story jumped right in while I was still writing on Fire, and the Earth one followed. Only the Wind one didn’t want to cooperate, but I gave it a lot of thinking and now I have my plot thought out for that, too. Liza: I find Wind to be problematic myself. It’s always blowing things down. It took out an entire Pine forest that I had cut paths in. I went into mourning over the loss of that forest. But I digress. Hey peeps, see how nicely Devika stays on topic? Devika: I wish the wind would tear out a pine forest here! Some political hot-shot (read: idiot) had decided to plant pine trees in huge quantities all over the island, although there are a million more useful trees he could’ve chosen. The result? Draughts! Liza: Yes! I tricked Devika into digressing! Thank you, pine trees. Now, describe the hero in five words. Liza: I like that you give your characters both good and not so good attributes? Devika: Thanks. I try to make them as human and credible as possible. I’m tired of reading about characters that are only bad or only good. Liza: You can safely read my books then. If your main character had been allowed to write the novel rather than you, how would the story have been different? Devika: I’m sure that Felicia would have wanted more action, more steamy scenes with Joshua, and a connection to other paranormal / supernatural beings. She’s freaking intent on finding out whether there’s a whole group of specially gifted people out there like the mutants from ‘X-Men’. Devika: Looks like you’d get along nicely with Felicia. ;-) Speaking of ghosts, you should come to Sri Lanka and bring your house ghosts on a holiday. This island is chock full of ghosts (if you can believe what people say here). They’d sure give the Ghostbusters a run for their money. Liza: And yet again I tricked Devika into digressing. This is fun. If you met an alien from outer space, how would you explain what you (as an author) actually do? Devika: What a crazy and awesome question! I’d tell it I rule over imagination and words, and make people think, and give them a chance to lose themselves in what could be. Liza: Congrats! You get the best answer so far award! Devika: Thank you! *glows with pride* Do I need to whip out my Oscar / Pulitzer Prize / Nobel Prize speech? Liza: Devika, I say this with the upmost love, but girlfriend you are way too over-prepared! Back to the interview. Is there any topic that fascinates you or a genre you’d really like to write in? Devika: I am very comfortable with the romance genre (contemporary and paranormal), but I’d really love to write a science-fiction novel one day. None of the alien stuff, but something dystopian where nature has taken revenge on people for abusing her. Devika: Whoa, how clever of you to mention that! *hands award to Liza for asking something that couldn’t have been more unexpected or more brilliant* I absolutely love “The Hitchhiker’s Guide to the Galaxy”! As for my potted anthurium (no petulant petunias, sorry), they were probably somewhere frolicking with the ghosts when it happened. Liza: Space! They were frolicking in space. Now tell us the stupidest thing you’ve ever done. Devika: Not going to university though I had passed high school with flying colours and everyone expected me to become a doctor or something. Oh wait, that might also be the most intelligent thing I’ve done because otherwise I wouldn’t be happily married now, and I wouldn’t have a job as a writer and author that I love and can do from home. Liza: AHA! So this was actually the smartest thing you’ve done. Finally, you answered something wrong...only it’s not wrong, it was in fact, brilliant. I believed what we’ve learned from this interview is that you cannot go wrong, when you go with Devika Fernando. 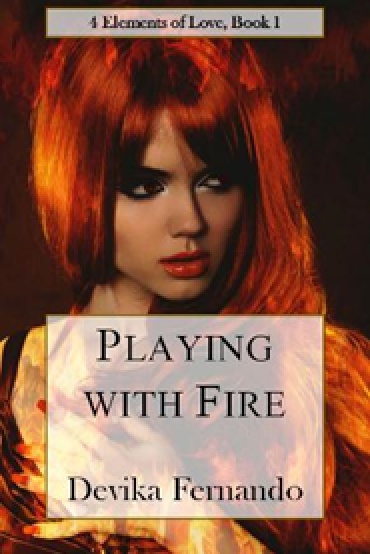 And with that satisfying conclusion of a most enjoyable chat, let’s check out Devika’s book Playing With Fire. prepare to get burned – or to fall in love. Yes, the harder you try to behave, the harder I try to lure you off the path. I just needed help from ghosts and pine trees. We all havee our luring weaknesses. Great interview! I know Devika from around FB and author circles. I didn't realize how brilliant she is. :) Love getting to know more about her!